Our cooperation with public institutions makes our pedagogical work transparent to the community. In 2013, we participated in the external evaluation and received 4 stars. Museums, Berlin Zoo, Aquarium and planetarium, to nurture the children’s urge to research and learn. Together with the children, we have decided to sponsor an underprivileged, orphaned child from the third world. This allows the children to experience that they can actively show solidarity by offering support so that the child’s and its family’s situation can be improved in a sustainable way. If you wish to find out more about our sponsor child, please approach us. Parent cooperation is vital. Parents are the most important people to their children. We have regular parent evenings and short, informal conversations to communicate and exchange information. Information about the day-to-day running of the kindergarten and upcoming dates are posted on the parent information wall. We also communicate important dates via email. Furthermore, we conduct parent talks to inform the parents about their child’s development. Although we are always approachable, we set clear rules and structures, which we talk about in a detailed introductory meeting. Parents can spend some time observing the day to day running of the kindergarten, share their resources, and are important to create a trusting and cooperative environment. In the cloak room, parents find a letterbox for requests or suggestions to ensure anonymity, if needed. Transparency, exchange of information, appreciation, recognition and good will are paramount. In order to build a foundation of trust, we invite the parents to an afternoon of art and craft with their child twice a year. We regularly distribute evaluation sheets and questionnaires to the parents in order to receive effective feedback regarding the pedagogical work with the children and adults. Once a month, we discuss relevant topics with the parent representatives. The lilolei-team welcomes open talks, requests and suggestions from the parents. Pre-school work begins as soon as a child enters our kindergarten. We aim to prepare the children for the challenges at school as best as possible through individual and specific support. The materials used in pre-school lessons is chosen to best cater for each child’s individual needs. Therefore the whole group is divided into three groups based on the children’s age or developmental level. This allows us to support each child individually to develop their competencies. Pre-school lessons are allotted specific times in our daily and weekly plan. This means that the children receive specific instruction to introduce them to basic numeracy and literacy. Furthermore, the children learn about routines and rules such as visiting the toilet before their ‘Pre-School’, putting up their hand, remaining in their seats, concentrating, and keeping their folder in order. We encourage the children to take responsibility by giving the children homework for which the children are responsible. We aim to prepare the children for school in a playful manner. The children shall learn to enjoy learning and become motivated through their own achievements. Considering the demands that society puts on children, one of the most important aspects of a kindergarten is the transition from kindergarten to school. This means that priority is given to supporting and enabling children to become resilient. In all areas children shall be encouraged supported to consolidate areas of strength and work on and reduce their weaknesses. In their pre-school years we support the children so that they can meet the challenges in primary school. To conclude the pre-school work with the children, we visit a primary school class. This allows the children to overcome any fears they associate with school and see a school through their own eyes. The new version of the Berlin School Law does not include an evaluation of a child’s ‘School-Readiness’. Primary schools are required to cater for all children. Through observation, documentation, and the behavior of the child during their pre-school work, we can provide information about your child’s ‘School-Readiness’ and a suitable child-oriented school. Once a year, we organize an information evening for the parents of the children who will attend school the following year to exchange information about the start of school and the individual development of your own child. The children who will attend school the following year visit our cooperating first grade class together with their educators. The do crafts with the big children and spend a break time together on the school yard. Once a year, we plan a 3 to 5 day kindergarten trip in spring/summer. At the end, we have a summer-good bye-party. The ‘school children’ receive a report card folder with a kindergarten report card, a certificate from the traffic school and a cd with an assortment of pictures from their time in kindergarten. Twice a year we offer an over-night stay at the kindergarten. The first over-night stay takes place in autumn for all children aged 1 to 6. The children return to kindergarten at 6pm and eat dinner together. After a program, the children choose a place to sleep. The next morning, the children share a breakfast together, after which they are picked up. Pre-school lessons take place twice a week. We work towards number and letter recognition. The children also learn not to interrupt, but to give a hand signal. The ‘Kindergaten Lilolei e.V.’ follows the ‚Berliner Bildungsprogramm‘. In 2003, the Berliner educational program was developed in order to priorities the education and support of the children, and to provide the education with a professional framework. The main goal is to enable the children to transition from kindergarten to school smoothly. The Berliner educational program identifies 7 learning areas: The Body, Movement and Health; Social and Cultural Environment; Communication: Languages, Literacy and Media; Fine Arts; Music; Fundamental Mathematics; and Fundamental Questions in Science and Technology. We see these the Berliner educational program as the core of our work in the kindergarten and relate the learning objectives for the children back to it. There are many good pedagogical guidelines, concepts and educational curricular. Especially because we are surrounded by such diversity, we work with each child based on their individual circumstances and needs. Children perceive their environment through their senses. Through movement they explore special relations, learn to organize their impressions and gather personal experiences. Certain movements support the children’s development of language skills, concentration, endurance and muscles. Before a child can speak, it uses body movements to express itself. In our work with the children we have to create space for them to move, experience a range of activities and the stimulation of all their senses. Every child develops at a different rate. It is not important when a child learns to walk, role or ride a bike, but rather that the child was allowed to master the skill on their own. We support and motivate the children in their independent development by helping them to develop trust and creating a safe environment in which the children can try out new skills. Movement education with music supports a holistic development. We provide the children with possibilities to be active during our daily walks and the weekly yoga and swimming lessons. The children can develop their fundamental movement skills, experience the joy when being active in a group and experience their own possibilities. We ensure a healthy diet by providing the children with fresh fruit that they can access at any time during the day and a weekly lunch menu that is rich in variety. The children bring their own breakfast and the afternoon snack. The educators monitor the children’s snack boxes to ensure that they are filled with healthy and balanced food. A catering service supplies the lunch. When ordering the food, we ensure that the children have a diverse menu. Of course, we also cater for children who eat a vegetarian diet, have food allergies or other dietary requirements. Together with the parents it was decided that the children are not allowed to bring any sweets to the kindergarten. Once a year, on a parent evening, the head of the kindergarten informs the parents about healthy eating guidelines. During the day, the children can help themselves to some fruit from a plate. After lunch, the children are provided with a fresh fruit and vegetable platter. The educators eat their breakfast and lunch together with the children. The children have access to water and unsweetened tea at all times. We visit nearby markets in order to introduce the children to healthy foods. Furthermore, we have a sport/movement room in which the children can develop their gross-motor and their sensory processing skills. Among others, we provide the following equipment: a climbing wall, trampoline, tricycle, Bobby Cars, and a balancing bench. When entering kindergarten, it is the first time that the children are confronted with a new environment. As a result, social processes are vital for the children’s learning processes. We create and broaden a social and cultural network for the children and their families, which is built on the child’s existing culture and environment. Through mutual respect and tolerance, the children get to know and learn to value other cultures, customs, traditions and above all diversity. We strive to integrate these values into our daily routine and support the children in orienting themselves in the world. Every Learning area requires the use of language. Children are growing up in a world full of media and information. Therefore we try to give the children the possibility to expand their communication tools. Multilingualism is used as a resource for learning processes. Our goal is to enable the children to increase their vocabulary. This includes their ability to express feelings and needs verbally. We carefully detect language difficulties and inform the children’s guardians about them. Language deficits are identified through assessing the literacy skills. Children should enjoy talking. We use a variety of strategies such as group conversations in the morning circle, finger and movement games, learning poems, Show & Tell, regular and shared reading, to encourage the children to talk. Twice a week, the older children have a pre-school lesson in which they learn to recognize letters and numbers (as you can see from the room decoration); make their first attempts at ‘writing’ and much more. Furthermore, the children have access to the reading corner at all times and ‘literacy’ is integrated into our daily routine, during the children’s quiet time. Literacy describes the child’s experiences with the world of books. Literacy education is very important for the children’s development. Reading scaffolds the children’s social-emotional, linguistic and cognitive development. It allows the children to improve their listening skills, their vocabulary, their ability to recognize sentence structures and melody and therefore express themselves and communicate adequately; their ability to understand and reflect on the meaning of texts; etc. We support these through the questions we discuss with the children during these reading times. Through the rhythmic use of language, nursery rhymes and songs aid the children in the process of adopting sentence patterns into their own language. The children show a strong interest in German as well as English books and enjoy literacy education every day. Children are artists who create their environment in their own way and style. Through early encouragement even small children can engage in artistic activities. Small children, who cannot yet talk, use pictures to communicate. The children become lost in their imagination when they are engaged in artistic activities and are no longer aware of their surroundings in that moment. The child processes what it has experienced and communicates the pictures how it perceived them. Children find joy and fun in creating pieces of art and regard their finished products with great pride. We support the children by providing them with a wide range of materials to experiment with. The children learn about colours, shapes and different materials. The Kita ‘Lilolei’ has an atelier, which is used for different projects. The children can access all materials freely. Being exposed to music challenges and supports the development of a child’s personality. Children approach music openly and with great interest. They find great joy in learning new songs and using their self-made instruments. In their first years, children already develop an understanding of the basic components that music is made up of: pitch, sound, rhythm and melody. Depending on their cultural background children their understanding is shaped differently. Music, communal singing, movement education and creating music support a holistic development. Engaging with music through singing, rhyming and dancing is a vital prat of our daily and weekly routine, especially during the children’s yoga lesson. Musical instruments and music (cd-player) are freely accessible to the children at all times. Mathematical understanding is an important part of life. By exposing the children to Mathematics from an early age aids them in developing basic mathematical understandings. They learn to let go of concrete materials and use abstract mathematical terminology. We created a specific pedagogical frame within the weekly plan. During pre-school, the children are exposed to numeracy through going shopping (counting money), counting games, board games, etc. Furthermore, the children learn to recognize and name numbers, which is supported during the pre-school lessons. Above all, Mathematics supports the development of logical thinking. Many “Why-Questions” of a child are based on scientific technological phenomena. Children observe, describe, compare and judge their world and perceive it this way. Out in nature, children learn about scientific connections and conduct experiments. The research the world in their own way. As a result, they have early childhood experiences with basic science and Mathematics. We support this by conducting a range of experiments with the children. We provide as much space and time as possible for the children to give in to their urge to explore. The main point is that the children are active and participate constructively in the learning processes together with the educators. Furthermore, we integrate the living world, by encouraging the children’s interest and seek to encounter animals in nature. From birth on, children are competent and actively conceive and shape their surroundings, education and development. Children continuously strive for autonomy and self-realization. We put the child with its individual skills and abilities in the center of our work. Furthermore, we see it as our social responsibility to strengthen the children, care for them, support them and educate them so that they can meet the challenges they may face in the world. We aim to assist the children to further develop their strengths and overcome or find ways to work around their weaknesses. Educators are the children’s partners. They provide opportunities to gain knowledge, experience authentic life-situations, support them in the development of their identity, creativity, and assist them to experience their creative power through play. Educators are at the same time teachers and students. Through continual communication with children, parents and other adults, they identify which situations (so called key situations) are important in a child’s life – specifically, the needs and interests of the child. The pedagogical work is based on the analysis of situations. Therefore, planning is a continual process which is being documented and reflected upon. Our educators are persons of trust for all the children. All staff members are responsible for all the children in the group and approachable for each child. The educators’ attitude towards the children is characterized by respect for the child as an individual. The support is based on the individual needs of the child. Together with the families, we care for the well-being of the children and the parents. The basis for this is mutual trust. We establish rules together with the children, which scaffolds their development of independence. To strengthen the trust between the children and the educators, their reactions are honest and characterized by appreciation and acceptance. The educators act as role-models for the children and as such aim to maintain a respectful attitude towards each other. Because children are clever, they sometimes try to play the educators out against each other. Within the framework of the negotiated and established rules there is space for the educators to scaffold the children’s ability to act independently and responsibly. We constantly motivate the children to act independently by giving them child-appropriate duties such as: table duty or tooth brushing duty. The educators nurture considerate and respectful behavior among the children. We also allow the children to seek solutions to their ‘problems’ on their own. Therefore, we have democratically elected kindergarten speakers, who are the contact persons for the children and adults. Furthermore, kindergarten meetings can be called by both children and the educators at any time in order to discuss wishes, suggestions and problems. The most important tool of the educators is observation. It allows them to effectively support the children’s educational and developmental processes. We use the ‘Sprachlerntagebuch’ (Language Acquisition Diary) which has been field-tested by kindergartens and the Berlin Senate since 2004. We use it as a portfolio where we collect and document the children’s developmental steps. In addition, we also use observation and documentation tools such as the ‘Leuvener Engagiertheitsskala für Kinder (LES-K)’, free observation, a developmental rubric, which is based on the ‘Gelsenkirchener Entwicklungsbegleiter’, and Kuno Beller’s developmental table in order to identify developmental delays and behavior difficulties in kindergarten children. Once a year, or if needed more frequently, we meet with each parent to talk about the child’s development. To ensure that the pedagogical work is not interrupted during the opening hours, these meetings are held after 5pm and last approximately 1 to 1.5 hours. The child is not present during the meeting. In specific situations, these meeting can be held in the presence of the child. The children’s language development is nurtured and scaffolded in a bilingual system. This approach supports and supplements the children’s education. Learning a second language, in this case the English language, offers the children the opportunity to broaden their communication tools significantly. English is the leading language in intercultural exchange and business and is also taught and used as the second language in many countries. In a globalized world with its open and multicultural societies, in which the ability to communicate with others is vital – especially in Berlin-, our bilingual concept is an appropriate alternative to a monolingual German kindergarten. English language is used as an equal language to German in the day to day running of the kindergarten in order to foster its early acquisition as a second language. This supports the development of skills as well as the children’s cognitive development. Multilingualism is used as a source of educational processes. The entire daily routine is lived in both languages. Considering demands society puts on children, one main focus is the transition from kindergarten to school. It is our goal to familiarize the child with the other language in an authentic setting focusing on day to day routines and conversations. Seeing that we take children from different countries and also sometimes for short periods, it is important to nurture the existing English language skills and expand on them. The founder of Lilolei has decided to adopt an approach based on the ‘Situationsansatz’ as it is proven to be effective in meeting the educational requirements of the children and their families while taking their social situation into consideration. In a ‘Situationsansatz’ approach, the children learn actively and independently through their interactions with others. The child’s personal life situation poses problems and learning opportunities through which the child can learn together with others. The actual learning happens as a result of the communication, action and reflection during the problem solving process. Educational psychologists, pedagogues, and sociologists have found that the basis for life-long-learning is built in the child’s early years. We see the child as a person who strives to actively and independently construct their knowledge of how the world works. Children also actively construct solutions for problems, rules, world views and identities. They are continuously involved in the process of education themselves and are constantly confronted with social changes such as: diversity, reality, ‘virtuality’, personality, or gender. More and more, our children are asked to be involved in their own education. In our kindergarten we provide possibilities for the children to gather experiences and prove themselves in relation to the others. For that we provide many incentives and possibilities for the children to express themselves. We reflect on situations and experiences that are of immediate importance to the children or have just occurred in order to help the children to process them. The goal of the ‘Situationsansatz’ is to view education, the development of resilience, and the supervision and caring for children as a social responsibility. The children are encouraged to identify topics together with the educators. The aim of this approach is to develop autonomy, solidarity and competence. These are interconnected and are based on the democratic values and social developments. Autonomy: The children are supported in their development towards being self-determined and independent. They have the right to be involved and have their say. As such, we involve the children and allow them to have their say in the negotiation of the kindergarten rules. This allows the children to get to know and judge their abilities and strengths. Solidarity: Solidarity means that the children are made aware of and guided towards showing respectful behavior within society. Acceptance of other people and views, collaborative, tolerant team work. The acceptance of rules. Above all, we value mutual respect, deference and tolerance. Competence: Developing competence means that the children are being enabled to deal with and handle situations competently. For that, the child is assisted to develop trust in his or her own psychological and physical abilities. Our daily routine begins at 8am. The children can also be dropped-off later. After greeting the children and a short hand-over chat with the parents, the day begins with free play. This allows the children to arrive and get settled in their own time. Between 8.30am and 9am, we have a joint, informal breakfast. One of the most important rituals is the morning circle. It begins at 9am and ends at 9.30am. In the circle, we sing together, play finger- and movement games, hear poems, and talk about topics, names, numbers, the days of the week, the months, and the seasons. The morning circle is conducted bilingually. On Mondays, the children have Show & Tell. This means that the children may bring an object from home, such as a favorite toy, a book, a family picture, etc., to present it to the group and answer questions from the children and educators. The children can also tell the group about something they have experienced. Show & Tell supports the children’s language development as well as their ability to concentrate and listen. The children have the opportunity to overcome their shyness and practice their public speaking skills. Between 9.30am and 11.30am, we offer activities from a variety of learning areas. From noon until 1pm, we have lunch. We focus on hygiene (e.g. hand washing before and after lunch and teeth brushing after lunch), and a healthy and diverse diet. The children are involved in setting the tables. In the play room, the children can find out on a chart with photographs what job they are responsible for each day. The quiet time is from 1pm until 2.45pm. During quiet time, the children who nap go into the sleeping room and the bigger children enjoy a period of relaxation in the play room. Whether a child has a nap or not is decided based on conversations with the parents, observation, or the needs of the child on the day. Every child is provided with space and time to relax. In the beginning of the quiet time, the children enjoy a listening to a story, poetry or music. Every child is given the space to calm down. From 3pm until 3.30pm, the children eat an afternoon snack, which is followed by free play and the picking- up time from 3.30pm until 5pm. We create an environment in which the children can prepare, process and understand life situations. They are offered a diverse range of possibilities to engage in activities catering for their needs, inclination, abilities and interests. In summer the snack is often eaten on the nearby playground. In that case, the parents pick up their children from there. A sign in the Lilolei window will inform the parents about where to find us. The kita – „Deutsch-Englischer Kindergarten e.V.“ closes at 5pm. Once a month, we plan a larger excursion. This supports the sense of community within the group. Among other places we visit the Wansee, Teufelsberg, theatres or the Zoo. We also make sure that we visit playgrounds other than the once nearby. During these visits to other environments, the children gather experiences that foster their special awareness. At the same time, the children engage in road-safety education. Furthermore, we have a yearly theme. This theme, e.g. Berlin or The Arts and Cultures, stay with the group throughout the year and all learning areas. Once a year, in spring/summer, we plan a 3 to 5 day kindergarten trip. In order to prepare the children, we offer a sleep-over at the kindergarten twice a year. Each day, the children experience a range of traffic situations, which is why we begin road-safety education begins as soon as the children enter the kindergarten. Once a year, a police officer visits our kindergarten and explains the most important rules. He also introduces the different vehicles to allow the children to understand their role and overcome some of their fears. Prior to this visit, we prepare the group. On a daily basis, we develop the children’s traffic awareness and address road-safety rules when we are out and about. In spring, we take the children who are 4 years and older to the ‘traffic school’ for several months. 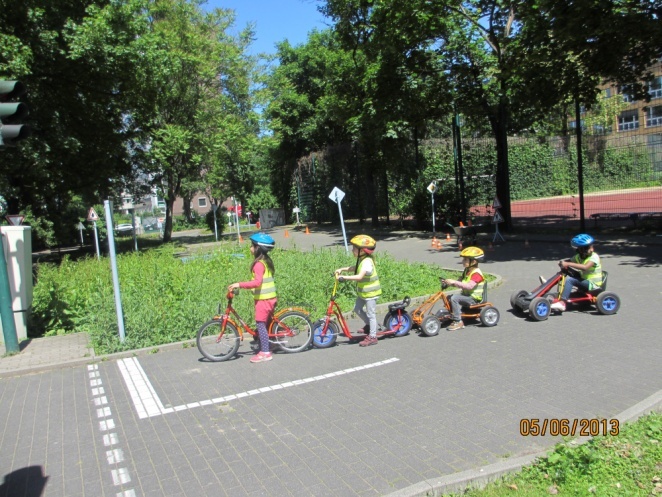 The children can understand the road rules more easily because the school provides a miniature traffic system that the children can move around in. To recognize a child’s success in this cooperation, the children receive a certificate at the end. Day trip are very important for children. They provide a balance, are educational and entertaining. The children’s independence and the cohesion within the group. The children love these excursions and being out in nature. It provides a change from the usual kindergarten routine. Both the smaller and the bigger children have a lot of fun. Again and again, we observe how the children live out their urge to explore when they are out in nature. One of the most popular destinations is the forest, because there are many things to explore and the children can rollick around. We also go on excursions to support the project the children are engaged in. For the Berlin project for example, we visit the ‘Brandenburg Gate’, the ‘Funkturm’, the TV Tower, the Victory Column, the ‘Schloß Charlottenburg’ etc. This allows the children to familiarize themselves with their city. To finish off the project the group goes on a city tour. A careful settling in period is important to ensure that the child develops a strong emotional bond to the educator while the child’s caregiver is still present. We aim to give the child a sense of safety and emotional security. These constitute the basis for a successful kindergarten start. The children can ease into their new routine, rules, rituals, rooms and familiarize themselves with the people in their kindergarten at their own pace. Prior to the settling –in period, we have a meeting with the child’s guardian to talk about the process. In this meeting, the guardians are informed about which educator is in charge of their child’s settling in period, explain the importance of the presence of the child’s guardian and describe the daily routine during the settling-in period. The educator and the guardian will also exchange detailed information about the child’s developmental level, eating habits, favorite toys, allergies and/or illnesses, etc. We also support the guardian in dealing with the new situation that they and face with their child. For a gentle settling-in process, parents should schedule 2 to 4 weeks. In the beginning, the educator will observe the child and its guardian, in order to find out how confident the child is feeling. Then the educator will carefully make contact with the child by offering a possiblitily to engage in play together. This way the educator can get to know the child and the child gets to know the educator. The child realizes that this is the adult, who will be there for him or her at kindergarten. During this process, communication between guardians and the educators is vital, because the child may behave very differently at kindergarten then at home. The children are confronted with numerous new, and interesting impressions, which may be overwhelming. Suddenly, they find themselves in large rooms that are set up specifically for children, new play materials, new adults, new children and so much more. This may make your child curious but also shy and hesitant. Therefore we proceed carefully when guiding the child through this transition. In the beginning, the child and the guardian spend one to two hours in the kindergarten together. The educator attempts carefully to make contact with the child and build up trust by making play offers. Separation attempts are conducted based on how the child responds to this new environment. We help the child to build a trusting relationship to the educator by responding to its signals, needs and emotions as well as providing the child with space while providing assistance when needed. Generally, the guardian takes care of changing the child in the beginning. New play equipment stimulates the interest of the child and encourage the child to become actively involved. We provide appropriate materials for all age and developmental levels. Nevertheless it is important for many children to bring an object that it feels emotionally connected to such as a doll, toy or a stuffed animal. This object can provide a sense of safety when the parents are not in the room. As the child spends longer periods of time in the kindergarten, he or she gets to know the new routine step by step. The consistent routine is important for the child in order to develop trust and give the child the sense that he or she knows what is happening next. At the end of the settling-in period, the educator meets with the parents to share information about how the child is managing his or her day at kindergarten. The parents find out how the child behaves when the parents are absent, how he or she plays and eats. At the end, the parents can share their wishes or goals regarding their child. After about half a year, the parents are given a questionnaire, on which they can indicate whether they were happy with their child’s settling-in period. Our team is the core of the kindergarten. The basis of team work is effective communication. This includes supporting and complementing each other. The collaboration within the team creates a cooperative, equal, open and harmonious basis for team work. Every employee contributes according to their area of work. The necessary preparation and reflection times as well as weekly team meetings are integrated in the daily running of the kindergarten. During the team meetings, the educators’ observations regarding the pedagogical work and administrative tasks are discussed and organized. The strong team spirit is based on constructive discussions and democratic decision making processes. Once a month the entire team meets in order to reflect on its work with the necessary objectivity. The team is regularly engaging is professional development. Once a week, the team comes together in order to share observations and identify ideas and interests of the children, which are used to plan and prepare projects, seasonal topics, pole play activities and songs. A lot of time is given to discuss individual children and their behavior, skills and abilities, conflicts, difficulties, fears, position within society as well as their social, emotional, motoric and cognitive development and the child’s relationship to its care-givers, guardians, and the other children in the group. The team deliberates on strategies to solve problems and prepares parent meetings together. Furthermore, the team plans the daily routine including, work hours, responsibilities, activities, the conducting of parent meetings, planning celebrations, planning parent evenings, organizes ideas and materials collaboratively and reflecting on possible changes within the team, current themes, the yearly planning and so forth. The team engages in informal, professional exchanges of ideas on a regular basis. In order to build on our abilities and competencies, all team members engage in professional training regularly. Every employee has the right to participate in trainings that are offered or take educational leave.